Designed to be used with either the Sequoia Seedling Or The Power-Con Version of the Sequoia Sapling. or as the production model, a stand alone product. The type of input cord determines the type of use. system of prefilters or Direct to wall... with the appropriate power cord in use with it. And the power circuit breakers make this available as a stand alone system, legal to plug straight into wall duplexes if desired. This unit has an authentic Neutrik Power-Con 20 Amp connector to feed it, via either a Seoprene® 12 gauge Or The 1116 Royal Fabrication used to make all our high current capable hand weaved Power Cords. 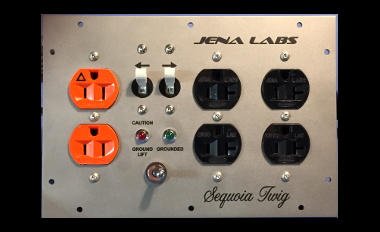 Features full filtration and Isolation for each Heavy Duty Hubble-JENA Enhanced Duplex, two standard 20 amp and one isolated ground (orange) 15 amp type. A true ground lift disconnect or engagement on the separate isolated ground based Duplex. fully independent grounding for each duplex, plus the design is always case grounded independent of the status of the ground lift system. - this is a safe design. Authentic NKK high current switch to lift the ground on the separate ground (Orange) Duplex. There are two LED indicators to show the status of being grounded or lifted on the Orange isolated ground duplex. 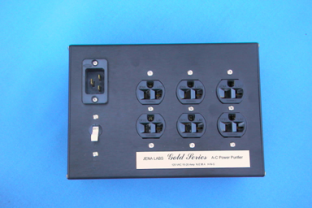 Designed to accept different power cords with the built in power-con 20 amp input. this is a major feature going forward. 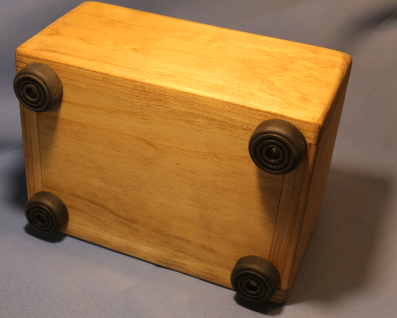 A wooden box is now the housing the faceplate is attached to. Separate power cord can be for any system of a USA 120VAC configuration including straight from a 120VAC wall or any Sequoia AC Conditioner as long as the cord has a power-con connector at its output side. This unit Really Performs Very Well - the modular aspect - ground lift on a duplex - the physical extension - real Wow factor! NEW - announcement of this product. The award is both for the Sequoia Sapling and the Sequoia Twig prototype one. Below: The 2nd prototype series & production model final. Above: Face Plate made of Stainless Steel and Laser engraved lettering. 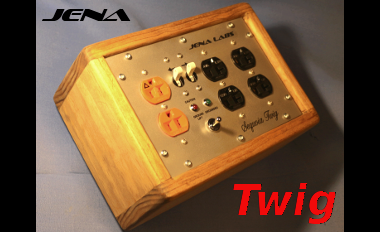 Shows the Power-con input plugs and a Basic JENA cord as the option here. it has feet of course. I have to get up real early tomorrow and I am going to bed, BUT I need to let you know that the Sequoia Twig made a HUGE difference. The Sequoia Twig is really incredible. Most of my experience with power conditioners is there is a sense of some improvement but is not truly audible. The Twig on the other hand is absolutely audible. It is like you are hearing silence, lack of noise. I am able to power all I need with my current configuration but what would be the cost of it with the extra duplex if I trade my prototype back in to you. Thanks Mike. I’ll be in touch. Paraphrased - "Wow, that was not subtle, Do you hear that - (I, said yes) - you really knocked it out of the park again..."
He was using the ground lift and it really did make a huge difference... I was there and although - we made it - - it really does work as designed. Our earlier customers may remember our "The Gold AC power conditioner... and The Platinum. long ago this was an armature based filter of good quality and sold very well. - it was a very good system for its time and did provide the basis of future designs we pioneered. it did not have a ground lift system. nor was the input plug locking nor any indicator status LEDS on it. Time changes electronic possibilities and we respond by redesign with what is possible, with the best available. The ground lift switch was designed by us to eliminate ground hum often produced in certain types of gear - like a turntable motor or other grounding issues with specific problems where an unsafe "Cheater" plug adapter is sometimes used... this is much safer and works extremely well by design. 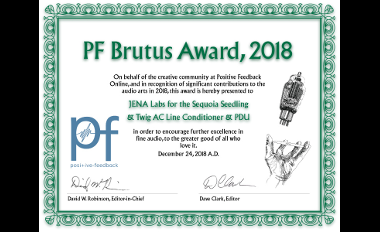 However the thing to actually consider that this product in combination with its being an extension of the primary hub of the system power conditioning via a Sequoia Seedling or Power-Con version of the Sequoia Sapling... is actually its real purpose... and will really work to enhance the sound of the system itself, rather profoundly. 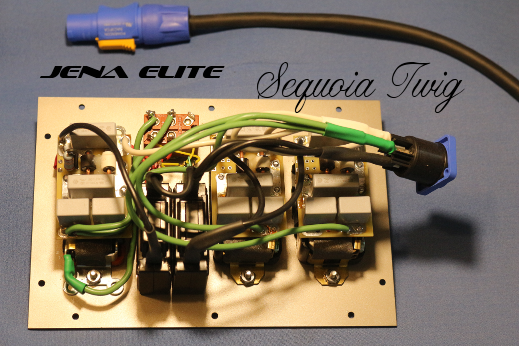 More available outs and better performance throughout the system - it will handle the power draw as these filter networks are not taxed to the limits of the boards - deigned to be used in the massive Sequoia and even there can handle the current with ease. in order to enhance and extend the functional use of each in a true modular system. The input is a Neutrik Power-Con 20 designed to match and lock directly into the Sequoia Seedling or the Sequoia Sapling if fitted with matching Power-Con 20 type outs. The feeding power cord determines length and type of use. The outputs are US standard heavy NEMA-JENA Duplexes. 20 amp high current as the standard grounded or 15 amp ground lift duplex. The reason the twig exists is to act as a physical spreader of AC power and the additional level of conditioning outward from the sequoia seedling is actually greater than the Sequoia Sapling by itself. and has a special feature of a ground lift capability for specific needs. This as a hub of sorts and allows for shorter power cords away from the source of power due to the distributed style if desired or longer if desired. By itself the Twig has built in over-volt or surge protection with the use of hydraulic-Magnetic circuit breakers... but is tolerant of inrush current draws from start-ups from power Amps with the use of this type of circuit breaker technology. This is a powerful filter module which can be a stand alone system. This is very well thought out as a system & gives the customer an advantage in the sound of your equipment compared to any other conditioning equipment made... except the flagship Sequoia itself... which really has no peer or competition. Why does it have a ground lift? Turntables, sometimes produce a hum that can be heard through the speakers, this should cure most of specific problems people have, if any. Yet the outlet itself is always grounded. and generally it provides additional conditioning in a hostile world.